Systems to develop an App for mariner skills assessment. 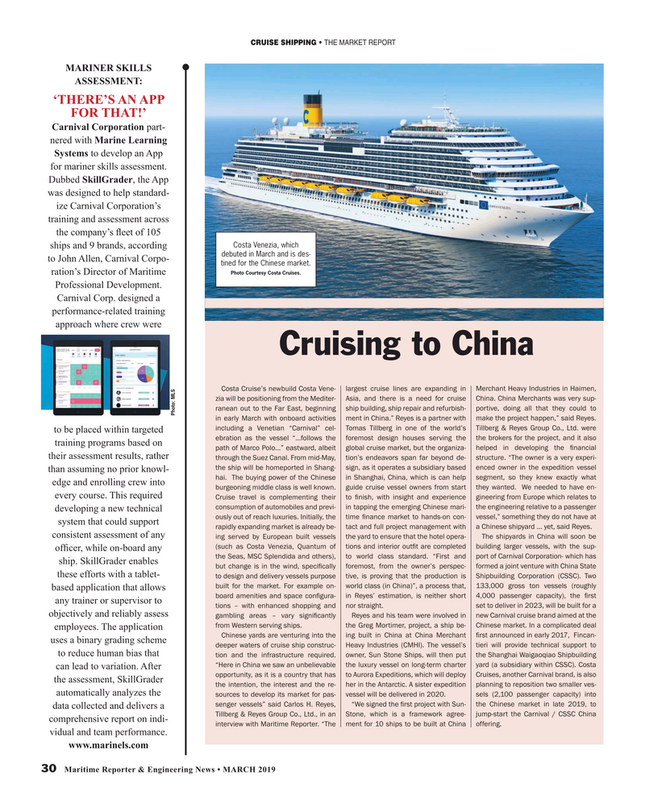 Costa Venezia, which ships and 9 brands, according debuted in March and is des- to John Allen, Carnival Corpo- tined for the Chinese market. Cruise travel is complementing their to ? nish, with insight and experience gineering from Europe which relates to consumption of automobiles and previ- in tapping the emerging Chinese mari- the engineering relative to a passenger developing a new technical ously out of reach luxuries. Initially, the time ? nance market to hands-on con- vessel,” something they do not have at system that could support rapidly expanding market is already be- tact and full project management with a Chinese shipyard … yet, said Reyes.